These Turks exchange mobility for heavier armour on both rider and mount. 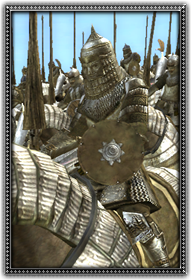 Supremely skilled warriors who excel in armed combat and horse riding, they are armed with a lance and mace. Turkomans are known to train their horses to be especially hardy by feeding them little food and less water prior to seeing heavy use such as battle.